The Andreaeopsida grow on siliceous rocks, and are distributed throughout the world predominantly in colder climates, such as at higher elevations or at higher latitudes. 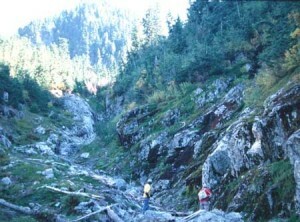 The species in this class are typically blackish to dark reddish-brown and form short and brittle brittle tufts or turfs. Unlike in some other classes, such as the Bryopsida, the protonema in the Andraeopsida are thalloid. Furthermore, all members of this class are autoicous, meaning that both the female and male reproductive organs occur in separate clusters on the same gametophyte. Most species have unistratose leaves, with multistratosity confined to the midrib of costate species. 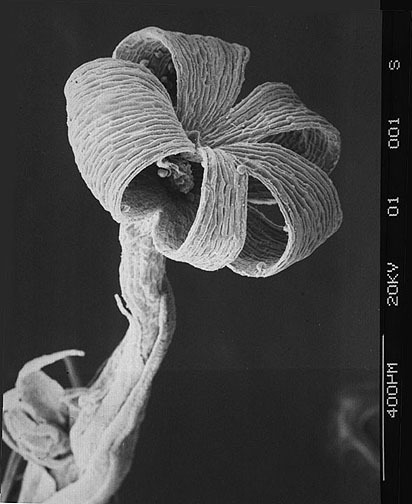 An important feature of this class concerns the unique structure of the sporangium. The sporangium has four (or more) lines of dehiscence, with the tips of the intervening segments remaining attached to one another at the “polar” ends. The resulting structure is reminiscent of a lantern, hence members of this class are popularly referred to as the “lantern mosses”. The lines of dehiscence open when the sporangium is dry and closes when it is moist. This allows for spores to be dispersed over a longer time period, improving the chances for the spores to be dispersed during optimum conditions. 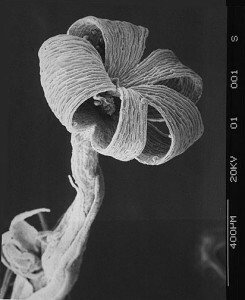 Andraeopsids do not have a seta; instead, the sporangium is elevated by a pseudopodium (as seen in this scanning electron micrograph). It is important to note that the pseudopodium, also seen in the Sphagnopsida, is composed of gametophytic tissue.